During the last eight years, we have seen Georgia evolve into the nation’s top state for business, which can be evidenced by our economic growth and our population boom. We can attribute much of our state’s success to the leadership of Gov. Nathan Deal, a two-term governor whose vision for a better Georgia and whose administrative execution of the policies that support that vision have allowed for transformative investments in economic development, education, criminal justice reform, infrastructure and transportation. On Tuesday, the Albany Area Chamber hosted and honored Gov. 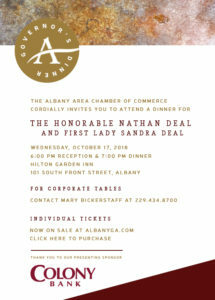 Deal and First Lady Sandra Deal during its inaugural Governor’s Dinner, attended by 300 members of the Albany area’s business and community leadership. The event marked the first time the 109-year-old regional chamber hosted a sitting governor for such an event. Since taking office in 2011, Gov. Nathan Deal has led Georgia to become the No. 1 state in the nation for business for six years in a row — a first in Georgia history — and helped create more than 750,000 private-sector jobs. Albany-Dougherty County and the Albany area have been beneficiaries of the pro-business policies of the last eight years, including increased investments and a renewed focus on creating a work force that meets the demands of business through efforts such as the High-Demand Career Initiative, which provides a pathway from school to industry in some of the state’s fastest-growing business sectors; increased investments in K-12 education, so that schools can do more with more and not more with less; Complete College Georgia, enabling more University System of Georgia students to graduate on time; and tax reform such as the elimination of manufacturers’ sales tax on energy, which lessens the burden on these job-creating industries. The Albany Area Chamber has consistently advocated for these resources and is proud to have successfully worked with members of the Georgia General Assembly to achieve these outcomes. Gov. Deal was instrumental in supporting Albany-Dougherty County in the aftermath of the tornadoes of 2017, and again this year, after October’s Hurricane Michael devastated much of Southwest Georgia. The governor’s special called session of the legislature has allowed for $270 million in immediate state relief to communities faced with steep recovery and rebuilding efforts. Work remains, as it should and as it always will. As we transition to a new administration and an often-changing legislature, we are hopeful – and expectant – that Georgia will continue to prosper through effective leadership, pragmatic investments that yield long-term economic and societal gains, and the policies to support a competitive business climate and an educated and skilled work force. We must continue to prioritize the commitments and investments that supported our businesses and our citizens. 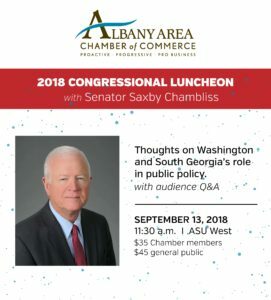 The Albany Area Chamber will continue to work with members of the Georgia General Assembly and with the Governor’s Office for that which benefits our members, our region and our state. 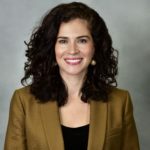 Barbara Rivera Holmes is the president and CEO of the Albany Area Chamber of Commerce, which advocates for business success through economic development and leadership. This entry was posted in Chamber News on December 10, 2018 by Mandy Kavanaugh. Albany, Ga.– The Albany Area Chamber of Commerce today announced the finalists of the 2018 Albany Under 40 awards, a program launched earlier this year that honors and celebrates the Albany Area’s emerging leaders and professionals in a variety of business sectors, each representing a component of the area’s diversified talentpool and economy. Finalists were considered from among the nearly 300 nominations that were received for Albany Under 40. Finalists will be recognized at the Albany Under 40 Awards Reception on August 16 at the Albany Museum of Art, during which category winners will be announced. One overall Albany Under 40 award winner, selected from among the category winners, will be announced at the Albany Area Chamber of Commerce’s 109thannual dinner on January 24, 2019. Visit albanyga.com to register for the Albany Under 40 Awards Reception. This entry was posted in Chamber News on July 17, 2018 by Mary Bickerstaff. Join the Albany Area Chamber of Commerce for Business After Hours on Thursday, November 15 at Chehaw. $100 prize drawing for Chamber members. Join the Albany Area Chamber of Commerce for Business After Hours on Tuesday, October 16, sponsored by the Albany Convention and Visitor’s Bureau, at Lovett Hall, Albany State University. $100 prize drawing for Chamber members. Join the Albany Area Chamber of Commerce for Business After Hours on Tuesday, September 18 at WSWG TV. $100 prize drawing for Chamber members. Join us for the August Business After Hours at Turner’s Fine Furniture for a great evening of fun, food and drinks. Meet new contacts, promote your business and build relationships within the community. Grab a co-worker or friend and join us at Turner’s Fine Furniture!